Thomas, Vanderbilt University, studies in the Computer Science Program at DIS Copenhagen this spring semester. He lives in a Homestay in Humlebæk, a small town just north of Copenhagen. Step 1: roll out of bed to the therapeutic sound of my host mom’s morning Spotify playlist. Most days she plays Wake Up and Smell the Coffee, other days it’s Sleepy Sunday Morning Tunes. If she’s really feelin’ it, maybe we’ll be graced by some vintage Jason Mraz in Chilled Throwbacks. Step 2: eat a delicious and nutritious breakfast with my host mom and whichever of the host siblings successfully completed Step 1. Step 3: Shower, brush teeth, grab the homestay-mom-prepared lunch marked with a permanent marker “T”, and embark on a (typically) brisk 4-minute walk to the train station. My morning is routine. My day could take me anywhere. Once that 7:49 AM train leaves Humlebæk Station headed for Nørreport, the possibilities are endless. I have some free time in the morning to explore different parts of the city. Today I’m crossing Superkilen off my list! Superkilen is a public park in the Nørrebro district of Copenhagen. It’s an awesome place to spend some time walking around…or jumping. Next up is lunch! For lunch, I stopped at Torvehallerne – a market about a 10-minute walk from DIS. Torvehallerne is made up of stalls with local, organic produce, gourmet food, and irresistible desserts. Today, I got pork Banh Mi and a snail pastry for dessert! Torvehallerne is a great place to go before class, after class, between classes…really anytime. The range of ethnic cuisine represented here is unrivaled. After a quick jaunt to Vestergade 23, I arrive at my class for the day: Computational Analysis of Big Data. This class attracted me because it is taught in Python (a language I had never coded in before) and it is centered on data science, a topic I was extremely interested to learn more about. The course is challenging but by the end, “Big Data” won’t just be a buzzword to you anymore. The trains are so efficient here in Denmark they got me all the way to Louisiana in just under 40 minutes! Modern transportation technology is truly something to marvel at. Alas, no. My Danish village of 10,000 inhabitants is home to a famous modern art museum called Louisiana. The museum is only about a block from my house and it’s the perfect place to explore on a Saturday afternoon. On Thursdays, my host family and I walk to my host-grandparents’ house for dinner. The entire extended family is invited to these dinners and they have become the highlight of my experience here in Denmark. These Thursday-night dinners are the definition of hygge: cozy, warm, cheerful, inviting, the list of homey adjectives goes on. Tomorrow morning, I’ll wake up to the slow, acoustic songs emanating from the kitchen. I’ll have breakfast, get ready for the day, then take the train into the city. My day will begin and end in the small, Danish town of Humlebæk; those bookends are familiar and routine. Those unique and exciting adventures in the city – to Superkilen, Torvehallerne, Nyhavn, the Round Tower, Tivoli, Strøget, the Botanical Garden – change day by day. Recognize Thomas? 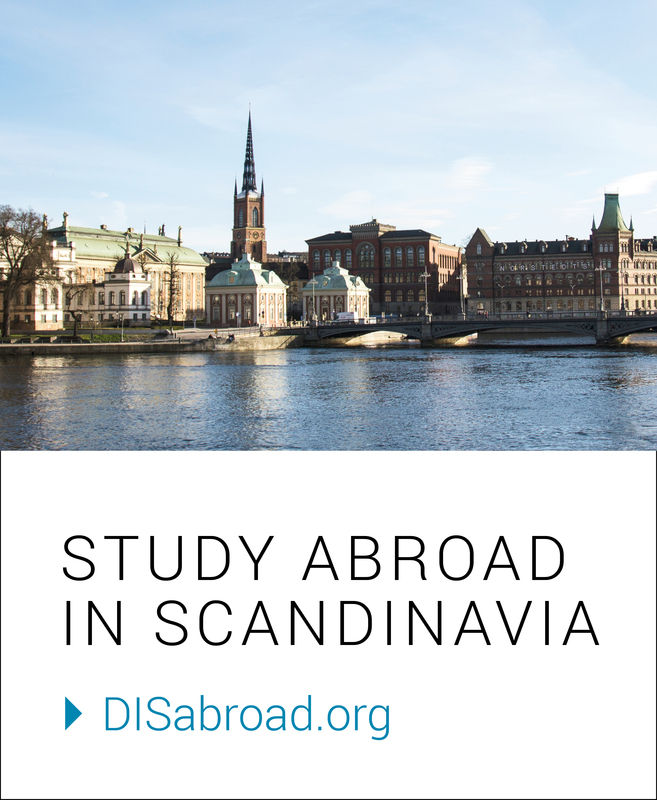 Maybe you’ve seen his blog on the DIS Copenhagen website!